Condition: Excellent. Sufficient margins, right margin about 0,5 cm. Verso: blank. Large size copper engraving. 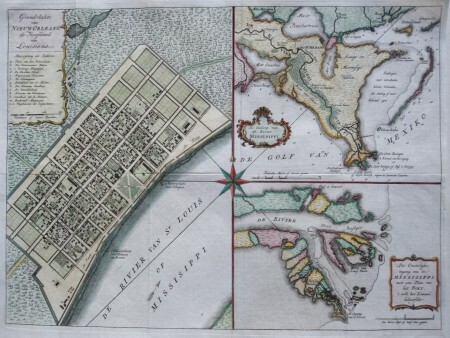 Sheet with three maps depicting New Orleans and vicinity. At left is a plan of the city of New Orleans (now the French Quarter) vividly depicting its protective canal, barracks and quays. It is based on De la Tour's 1720 plan. The second is a map of the vicinity of New Orleans including the delta and surrounding bayou. The third is a map of the location of Fort la Balisle at the mouth of the river, which sank into the marsh in the late 1700's. Each map has a delicately engraved title cartouche. At the center of the sheet is a large compass rose.